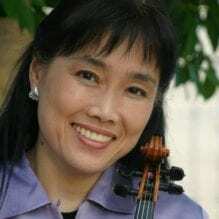 Hirono Oka joined the first violin section of The Philadelphia Orchestra in 1990. She made her first public appearance in her native Japan at the age of 11 with the Tokyo Symphony. After winning numerous competitions and awards in Japan, she came to the United States to continue her studies at the San Francisco Conservatory and the Curtis Institute of Music in Philadelphia. Her teachers have included Ivan Galamian, Jaime Laredo, Arnold Steinhardt, Felix Galimir, and Stuart Canin. Ms. Oka has appeared as soloist with the San Francisco Chamber Ensemble, the Utica Symphony, and numerous orchestras in the Philadelphia area. As a chamber musician, she has appeared with the Marlboro Music Festival, Chamber Music West in San Francisco, the Theatre Chamber Players of the Kennedy Center in Washington D.C., the Network for New Music, the Delaware Chamber Music Festival, and the Philadelphia Chamber Music Society. She has also toured throughout the United States with the Brandenburg Ensemble and Music from Marlboro. Ms. Oka has performed and collaborated with such world renowned artists as Mr. Laredo, Alexander Schneider, Leon Fleischer, Yefim Bronfman, and Murray Perahia. In addition to teaching privately, Ms. Oka is a faculty member of Temple University and its Music Preparatory Division.